An ever-increasing number of citizens and authorities all over the world are aware of the possible effects of climate change on the planet, albeit from a remove, as bystanders who are uncertain about what form and where these effects will be felt. CEO and Co-founder of Green Urban Data Alejandro Carbonell launched his startup in October 2017 specifically to respond to this situation with the use of existing technology. "We want to be part of the digitization of the climate change fight and, more importantly, to democratize power among local populations, giving them the tools to take action with their own hands,” he told CompassList at the recent Madrid South Summit. The company has developed two products, mainly with city authorities in mind as the immediate end-users. The principal product is a SaaS temperature regulator, drawing on existing information gathered by satellites – and also by sensors, if the population center is a Smart City – that allows users to observe patterns of change associated with climate change and its effects, and to mitigate against them. Urban planning is where Carbonell sees the greatest potential for this environmental monitoring and mitigation tool, especially for new urban areas under development. "The idea is to help new cities plan their layout holistically from minute one according to environmental factors, and to offset the negative impacts of climate change," Carbonell said. With literally hundreds of new cities under development, the implications of such a product on the localized battle against climate change cannot be understated. The SaaS's objective is not to warn of impending climactic disasters but to enable adaptation to climate change at the micro level. 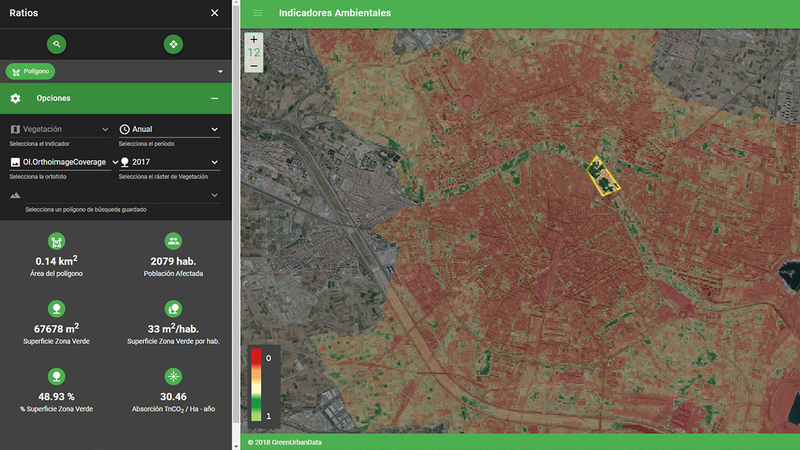 Its first component is big data assimilation of millions of historical and current satellite readings of cities, precise to a level of 30sqm, for varied measurements, like temperature, humidity, porosity of the soil, erosion and levels of vegetation. If the SaaS is used in a smart city where sensors are ubiquitous, then additional measurements, like contaminants and noise, are also compiled. The SaaS uses artificial intelligence (AI) to find connections between the data sets using multiple modeling techniques, for example, to chart temperature and its relationship to the amount of vegetation in a particular area, factoring in ground humidity or other variants. It then produces automated, predictive results and gives environmental recommendations for that particular area. The software is easy to use and users require only a tutorial to be able to produce automated results and recommendations for any 30 sqm area within the city. Spain's third-largest city with 750,000 inhabitants, Valencia, was the first major urban center to trial the product from December 2017. It has now renewed its subscription to the SaaS for 2019. Prior to its trial of Green Urban Data, city authorities had already collected a vast amount of environmental data. The authorities specifically wanted to monitor rising temperatures in the city, which they had detected through their data, but had no means to evaluate its impact on the city and on the level and quality of the vegetation. Working with Green Urban Data allowed authorities to identify heat spots within the city, such as a central area with many railway tracks. Trees were then planted to lower the localized temperature, creating a "green lung." The SaaS has also facilitated the planning of Europe's first bicycle "freeway" that encircles the whole city, taking temperature mitigation and pollution into account. "The data already existed, but what our product does is to make the data useful for town halls who need to manage the information, for companies to solve the problems encountered, and for citizens to inform them of the quality and change in their environment," said Carbonell. Green Urban Data's SaaS can be use by municipalities of any size – not only large cities. All of the other towns currently using the SaaS are in the Valencia Autonomous Region and include Torrente, Gandia, Alcoi and Elda. The latter municipality is using the application to be assessed themselves on their performance in the introduction of green zones by Carbonell and his team. The second product Green Urban Data offers is a city route planner for people seeking the healthiest – not the quickest – route possible. Designed for use by town halls and also individual users on their smartphones, the application takes advantage of smart city infrastructure to plot routes that avoid undesirable environmental factors. The Healthy Route Planner allows users to plan their routes taking into consideration variables such as amount of shade, different allergens from plants and noise levels. It also provides route options for those with mobility difficulties, taking into account the adaptability of city infrastructure to their needs. The planner assesses all the factors using city sensors and delivers the results in real time. “We have all this smart city technology in so many cities, but its sensory environment just wasn't being sufficiently used to provide any benefits,” said Carbonell. “We are now going beyond sustainable mobility to talk about healthy mobility. What does this mean? We all now know about the benefits of cycling or walking on a city's environment, but have no means to track the effect of our journey on our own health and mitigate any negative factors." To date, Green Urban Data has received €125,000 in funding in the one year since its inception: Valencia City Hall provided social innovation funding to complete the first MVP, the accelerator Lanzadera provided another tranche while the startup's owners funded the remainder. Now, Carbonell is looking for an additional €200,000 to scale the products and market them extensively from mid-2019. Green Urban Data's business model currently consists of signing yearly contracts with local authorities, with the pricing dependent on the population of the locality and the number of indicators assessed. The plan is eventually to provide pay-per-use options for authorities once additional funding is secured. Additional future features to be added to the climate monitoring app include flood risk and the predominance of invasive species.